The Tube cutter unit is designed to cut tubes with a diameter from 100 to 650 mm / 4" to 26". Mountable to all circular saws. Quick mounting and unmounting. Cut all tubes in 90 degree angle without indention due to special adhesive coated double roller. Just turn the acrylic tube on the ball beared rollers while cutting. 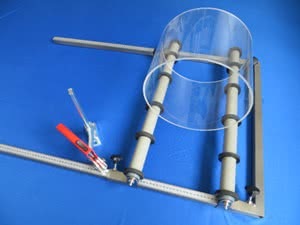 ⌧ Cutting tubes up to 650 mm / 26"